Press Release – Southfield, MI – Lewis & Dickstein, P.L.L.C. 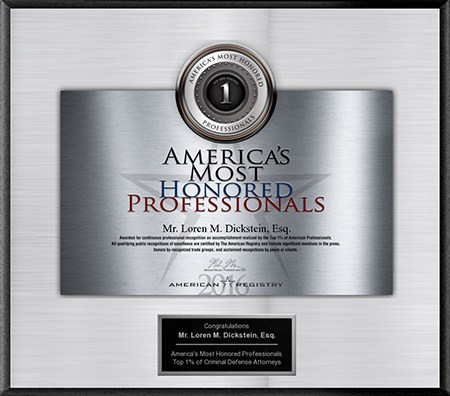 proudly announced today that Senior Partner Loren M. Dickstein has been selected by American Registry as one of America’s Most Honored Professionals, an award given to individuals in the top one percent of their profession. Mr. Dickstein has distinguished himself as an industry leader since 1995, excelling in the practice of criminal law, and was chosen for this honor based on the recognition of his peers, clients, and trade groups, as well as the many mentions of his work in the press. The many awards and achievements attained by Mr. Dickstein include a 10.0 rating by Avvo and an AV Preeminent designation by Martindale-Hubbell, both the top distinctions granted by those institutions. He was named a Top Attorney in Michigan by The New York Times and Crain’s Detroit Business, a SuperLawyer by Thompson-Reuters, a Top Lawyer in White Collar Crime by DBusiness, and was nationally ranked as a Superior DUI attorney by the National Advocacy for DUI Defense. Mr. Dickstein also won the American Jurisprudence Award, the Dean Arnold E. Schneider Award, the Client Distinction Award, and the 10 Best Client Satisfaction Award given by the American Institute of DUI/DWI Lawyers. Mr. Dickstein practices throughout Michigan where he has earned a reputation as a dedicated advocate for his clients in the United States Courts for the Eastern and Western Districts of Michigan, the United States Court of Appeals for the Sixth Circuit, state circuit and district courts all over Michigan, and every manner of administrative hearing venues. He started the law firm of Lewis & Dickstein, P.L.L.C. in Southfield, MI with prominent attorney Randall M. Lewis in 1998 and has helped to build one of the most respected criminal defense firms in Michigan. Before embarking on his career as a criminal defense attorney, Mr. Dickstein received his Juris Doctor from Wayne State University and his Bachelor of Business Administration from Western Michigan University. He then worked as a judicial clerk and a legal research clerk for a number of circuit court judges in Oakland County before going into practice.